Disturbance of asbestos is often not recognised. Workers may disturb materials themselves, or encounter previously damaged materials. Damage and disturbance of asbestos containing materials (ACMs) is often not recognised, whether workers disturb ACMs themselves, or encounter previously damaged materials. In some cases high risk situations may be present for many years before being identified. Workers and the public can be exposed to asbestos through a lack of awareness and unsafe work practices. Anyone in a building trade, persons in control of a workplace, facilities managers, maintenance engineers and safety representatives, need to be aware of the uses and likely locations of ACMs. It is a legal requirement in most jurisdictions that anyone who might accidentally disturb ACMs during the course of their normal works undergoes basic Asbestos Awareness Training. Basic Asbestos Awareness Training is the easiest way to equip staff and contractors with the essential knowledge to identify ACMs, understand the health risks they pose, and adopt Safe Work Methods. Although workplaces are required to have an Asbestos Register if ACMs are or may be present, many sites are not yet compliant, or the existing Register is inaccurate or out of date. This means that a large proportion of ACMs have not been identified, and there is a significant risk they will be accidentally disturbed even during minor building or maintenance works. All building and construction industry workers are likely to encounter asbestos in pre-1985 buildings, and we provide trade specific Asbestos Awareness Training. Our trainers have many years’ experience as Asbestos Assessors with international consultancies in Australia and the UK, and are postgraduates in a relevant science. Tailored training solutions can be delivered at the workplace, project site, or local venue. Top Image: Asbestos millboard (white) lining a/c electrics. 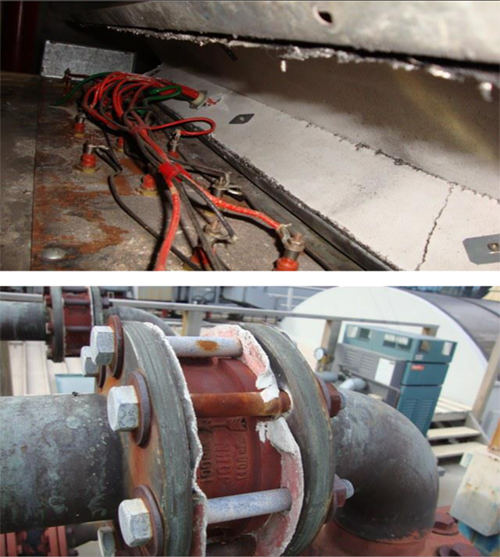 Bottom Image: Asbestos gaskets to rooftop plant / pipework.